Many parents feel embarrassed and shame at the fact their child has head-lice. So many parents suffer quietly and make up a fanciful story to explain their absence from work and their child’s absence from school, not realising that it is no reflection at all on their parenting skills. What most parents don’t realize is, even the cleanest heads can get head-lice ! I mean honestly how many parents do you know will sit at a bus stop or in the break room at work and when someone asks how their child is doing will openly smile and say “Oh just great he/she came home from school on Friday and I found head-lice all through their hair”. Yes well and if you do voice this you certainly clear the area fast as if you have the plague because if your child has Head-Lice you must have Head-Lice and nobody wants to catch it from you, right! So we make up a plausible story for everyone’s benefit, whilst suffering the long arduous agony of having to treat our kids hair by dumping all the harsh chemical “Head Lice Treatments” on them till we find the one that we think has worked, “right” yes and we all know how that works out for us. It is expensive, stinky, stressful and what’s worse we have no idea if and how much damage we are doing to our kids hair,scalp and health. So today I am sharing with you 2 Gentle Effective ways to treat “Head Lice” in the whole family right down to the youngest in the family. The first is the one that I use for my 2 granddaughters, both at school. We live in Queensland Australia, so summer being hot humid and moist giving Head Lice the perfect breading conditions on any child’s head. But first I would like to dispel some Myths about Head Lice before moving on to the 2 best natural treatments I feel are available on the market. Wrong, total misconception so stop shampooing your kid’s hair daily with commercial grade shampoos destroying their hair and scalp ph balance. They will do a fine job of that themselves when they are older. Human Head Lice do not infect animals so don’t put them through the horrid chemical bath you do to your child’s head or your liable to make them sick or worse, poison them to death. Head lice eggs will only fall onto bedding when they are dead or already hatched in the hair. The live head-lice can only survive for about 24 hours away from the human scalp, as they need to feed on scalp tissue and blood every 6 hours to stay alive. So changing sheets and bedding every few hours is not a priority, and this goes for furnishings and carpets as well. Wrong! most treatments off the shop shelves are pesticides and only kill the already hatched lice, even then it doesn’t always kill them due to the resistance they have built up to the pesticide you are dousing your kid with. Generally it just stuns them long enough for you to go through the hair with a head-lice comb to get them out. Head-Lice do not fly or jump from head to head as they don’t have wings and their jumping distance is so minimal that it is only when children are hugging, sharing brushes or hats and sitting so close to each other their hair strands are almost touching and that is how the head-lice spread. They lay their eggs (nits) on the hair shaft around 1.5 cm from the scalp. 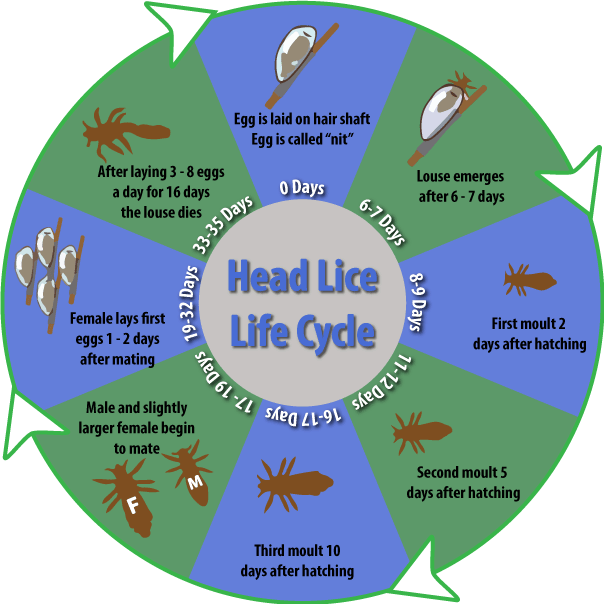 The head lice life cycle lasts between 33 and 35 days. Aloe Vera – You can use Aloe Vera to treat head-lice directly from the plant, if you know what species of plant you have and how to prepare the gel or you can use a recognised quality aloe vera based product which is my choice. Now apart from the great benefits that aloe has for soothing skin what a lot of people don’t know is Aloe Vera is naturally pest resistant. Meaning bugs don’t like it and that goes for head-lice as well. So I use 3 products from the Forever Living product range which I know are gentle, effective. I use them every year at the start of head-lice season on my grand-kids and we see a virtual nit free season after the first 2 treatments. We love them and swear by them. I learned that you could not only treat Head Lice with Tea Tree Oil but you can also make up a spray with it and use as a repellent on the kids hair before they go to school as well. So I asked Kathleen to assist me with putting some information out there about this and as always Kathleen with her big heart and willingness to share sent me an email in response with a link to her blog article she wrote on how she deals with head-lice. 1 – Liberally massage our Aloe Vera Gelly through your child’s hair making sure to cover the scalp. Leave in hair for 30 minutes. 2 – Shampoo hair with Aloe Jojoba Shampoo and rinse well. 3 – Apply a good amount of Aloe Jojoba Conditioning Rinse, massage through hair. With head-lice comb, comb through conditioner until all tangles are smoothed, going over each section of hair a couple of times rinsing comb, the head-lice and eggs will easily come out of hair whilst combing. Combing of hair to remove lice and eggs should only take about 5 minutes (unless hair is very long, thick or curly) rinse well and lightly towel dry hair and comb. Repeat this same process for the next 4 days to ensure complete removal of all eggs and adult lice. Tea Tree Oil – As used and suggested by my friend Kathleen. This is some of her story. For years it was like every other week one of the kids would come home with head lice or nits. Weekly the schools were sending home notices for people to check and treat. I swear these things evolved to become untreatable with the common pesticides so I looked at organics. I was using a product called Nit Enz but even as mild as it was it absolutely reeked. It did the job though. I did notice in one of the other products there was tea tree oil used with lemon as a preventative. Unfortunately that product has a pesticide in it also. I did some checking on tea tree oil and found that head lice didn’t like it so I started putting tea tree essential oil in a spray bottle of water, spraying the kids frequently. This has kept them at bay and we haven’t had an infestation for over a year now touch wood. Am really looking forward to reading the benefits of aloe as I’ve never noticed a scent or odour to aloe. There are probably many other natural and gentle ways to treat head lice that I am unaware of so please share with us in the comments box your experience with head lice and any gentle or natural ways you have found in treating this problem. I will say from my own experience with my grandchildren and treating their head-lice with the 3 Forever aloe vera products we have not seen those dreaded nits in their hair since. I do know my daughter uses a spray of vinegar and water to lightly spray inside their school caps to help with repelling the nits and to keep the caps nice and fresh and odour free. To make this spray it is just 1 part vinegar to 2 parts water. If you have enjoyed this article and have your own story to tell comment below and share with others.